This entry was posted in Cathedrals, Europe, Food, History, Hotels, Literature, Postcards, Spain, Travel, World Heritage and tagged Besalu, Catalonia, Catalonia Churches, Catalonia Independence, Catalonia Postcards, Culture, Life, Spain UNESCO. Bookmark the permalink. No people . . . my kind of place. March/April is a good time to visit places like these! I really like places like this too, not done much like this in Spain but your photos remind me of many villages in the Languedoc deep in South of France. Often these places are “deserted” during the heat of the day, absolutely nobody around. We always comment on how villages in France appear to be deserted, even in the North. 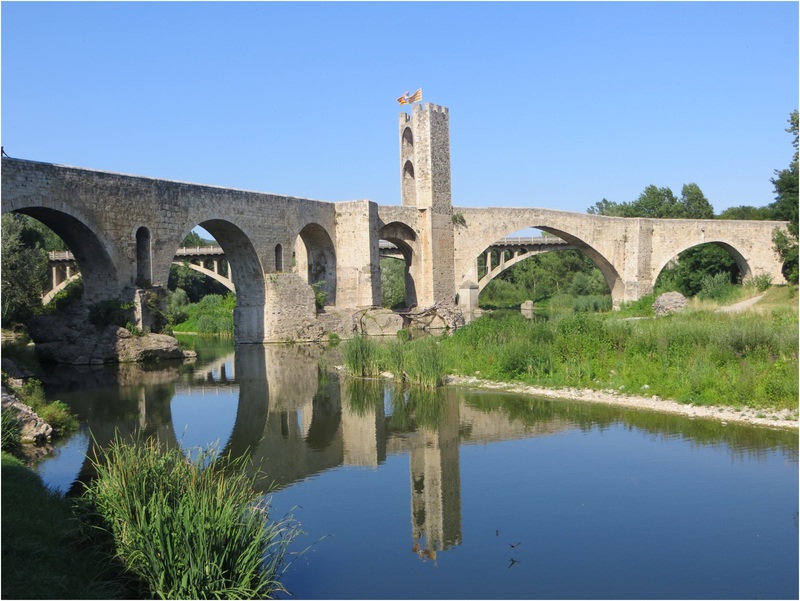 Besalú is quite touristy so we were surprised to find it like this in July. What a charming place! Those old stone walls look like they’d help to keep things cool. We tend to stay home during the tourist season and enjoy the respite from the masses. Looks like you do the same. Thanks Derrick. My favourite subjects, walls and doors. Thank you! The good thing about inanimate subjects is the time available to get the shot. Not a luxury that you have when photographing the wild life of the forest! Doors and gateways fascinate me… great selection of photos… another place to add to my growing list of where I’d like to go in Spain! Any of these moderate sized towns away from the big cities are worth a visit Lois! Do you speak Spanish, Andrew? Unfortunately I don’t! I know how to order beer and wine! That sounds enough – virtually bilingual! Absolutely. Actually it is amazing how well we can manage in a foreign language when travelling just so long as we do not have to get into a conversation. We just need time to work out the words and the order in which they come. A lovely place but I understand that it can get quite busy! Love the low vaulted archways..
Everything about the place is simply wonderful! The idea of sitting under an umbrella in the sun, with a cold beer, just watching the world go by in a pretty place like that is rather appealing just now. I can’t think why. That is a Scottish winter talking! You wouldn’t be disappointed Jo! How beautiful your photographs are and your descriptions take me there. Thank you Sue, I appreciate that!